When people ask me about my favourite gluten-free cities, Barcelona is very high on my list. Coming from London, where gluten-free options are aplenty, I have very high expectations but Barcelona doesn’t disappoint. From banging breakfasts through to late night Mexicana, gluten-free Barcelona is one of my favourite foodie cities in the world. So if you’re heading to its sunny shores soon, check out my list of fabulous gluten-free restaurants in Barcelona to make sure you enjoy the city just as much as I do. Before I get started making you drool though, I thought I’d share my tips for navigating the city and discovering new options for yourself. Firstly, it’s really easy to learn how to say ‘gluten-free’ in Spanish: ‘sin gluten’. In fact, in Barcelona the locals speak both Catalan (as it’s the capital of Catalonia) and Spanish, so you will see many signs and menus with everything listed in Catalan, Spanish and English. In fact, Celiac Travel has both Catalan and Spanish gluten-free cards for use in restaurants. As a visitor, it’s totally ok to learn just Spanish, especially if you’re travelling around the whole of Spain, as the locals wouldn’t really expect you to know Catalan. I usually print off a copy of the Spanish gluten-free restaurant card and carry it with me just in case – but I don’t think I’ve ever needed to actually use it. Most restaurant staff in Barcelona not only speak English but are also well versed in which items on their menu contain gluten, thankfully. When trying to discover new gluten-free restaurants in Barcelona before each trip, my first stop is always Instagram. Try out a few hashtags to see what you can find – and share your snaps and recommendations with the same hashtags afterwards to help others find the best gluten-free options around the city. #glutenfreebarcelona is a great one to start with, especially when if you’re looking for tips from other coeliac and gluten-free travellers. If you’d rather get some tips from the locals, try #singlutenbarcelona (Spanish) and #senseglutenbarcelona (Catalan) as this is often the best way to find out about which supermarkets stock what gluten-free products too. Ok – ready to discover sin gluten Barcelona for yourself? Let’s go! 🌟 Planning your trip? Check out my Barcelona city guide. This bakery was probably the foodie highlight of my recent trip to Barcelona. Located in the Sant Antoni district (conveniently right around the corner from the Market Hotel where I was staying), Amiette is a 100% gluten-free bakery that’s also genuinely delicious. I ended up coming here most mornings as I couldn’t resist the chance to have freshly baked chocolate croissants and bread rolls. Such a thing is a rare treat for me, even in London, so I took any chance I could to visit, Naturally, I was very disappointed when I arrived on Sunday to discover it was closed (top tip: stock up on Saturday). Everything I ate here was sublime; nothing fell to pieces at the first bite or tasted like cardboard. It was also such a joy to pop into a proper bakery, filled with lovely staff, every day to pick up some bread and treats. Not only would I say that this is the best gluten-free bakery in Barcelona but definitely in my top five in the world. They also make lactose-free products too for anyone who has the unfortunate double whammy of being intolerant to both. Pasticelía: another option if you’re staying in Eixample. Both these patisseries get excellent reviews. Forn Boix: bakery with two shops close to Las Ramblas that usually has a gluten-free section. When I visited the theme park at Mount Tibidabo, I was surprised to discover that Danone has a Yogurteria up there and that it’s really gluten-free friendly. In fact, they have six yogurterias across the whole of Barcelona, including one near Jaume metro station in El Born. Every topping, sauce and sundae were clearly marked as gluten-free, so it was really easy to choose what you wanted. Plus, the frozen yoghurt was delicious and quite light – perfect if you aren’t looking for something as heavy as gelato. Arlequino Gelato: opposite the Sagrada Familia, this gelato shop not only have their flavours clearly marked but they also have gluten-free cones apparently as well. Gelaaati Di Marco: this gelato shop is in the Bari Gotic and also caters to the lactose intolerant as well. This little oasis in El Raval is very popular with the cool kids – so much so that you’ll probably need to book to get a table on the weekends. It’s definitely worth being that organised as it ticks all the boxes for being a bit glam, with excellent food and a little bit different from your usual breakfast places (in all the right ways). It’s not cheap but definitely worth a visit at least once on your trip to Barcelona. 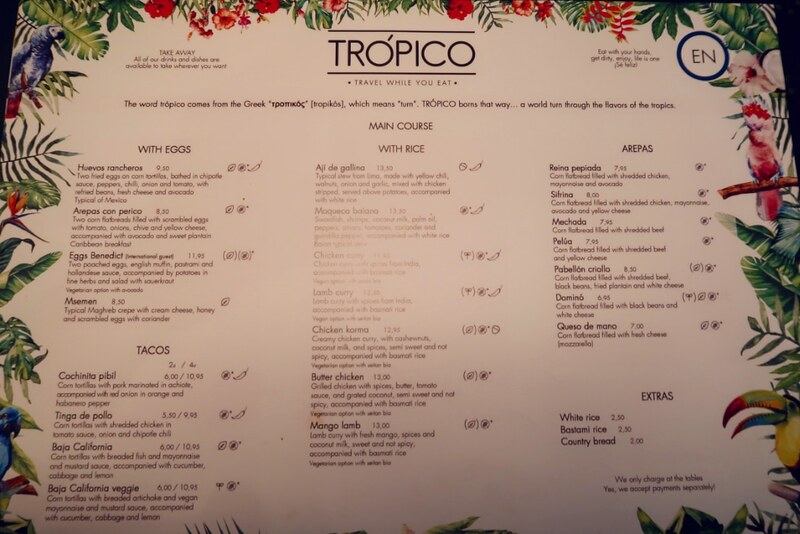 Tropico’s menu is a mixture of Caribbean/Central/South American on the menu means you have options like Huevos Rancheros and Arepas Con Perico – both of which are gluten-free. In fact, pretty much everything on the menu is marked as a gluten-free option, which is very handy. Their smoothie game is seriously on point as well. In fact, they have some of the most Instagramable (and delicious) smoothies I’ve ever tried. Too good to pass up. I always rave about Federal but that’s because they do brunch really well. So well, in fact, that it’s sometimes hard to get a table at their original Sant Antoni cafe. Their Gotic location is a bit roomier, with lots of outdoor seating, but both are excellent options for gluten-free breakfast in Barcelona. Every item on Federal’s menu, which is the same at both branches, clearly marks any allergens. Gluten-free bread isn’t listed as an option with classic brunch options (like Eggs Benedict) but it’s usually available as well. I also recommend adding one of their smoothies or juices to the order – I can’t resist ordering the Vegan Magic Monkey everytime I visit. This was one of my favourite gluten-free breakfast finds on my most recent trip to Barcelona. When I discovered that they served not just pancakes but also French Toast ‘sin gluten’, I was incredibly eager to visit. Thankfully it’s situated in the lower west side of Eixample, so not too far from my hotel in Sant Antoni. It’s quite a chilled cafe on a quiet street with only a small amount of outdoor seating, so it may not look like much on arrival but once you see their breakfast menu, you’ll be keen to give it a try too. I opted for the smoked salmon brunch plate, which was huge – complete with eggs, mushrooms, tomatoes and gluten-free toast. I wish I could have returned multiple times and tried everything on Copasetic’s menu as it is incredibly gluten-free friendly. This cafe may not be as fancy or Instagrammable as some of the other options listed above, but if you’re looking for a proper breakfast for a decent price, then this place is a great option. Flexitarians and clean eaters: Flax & Kale are for you. These three restaurants – spin-offs of the popular Teresa Carle veggie empire – make you feel fresher and healthier just by being in the space. I’ve had brunch in their ‘Cucina Flexitariana’ branch in El Raval for brunch and popped into their Passage branch for cold-pressed juice, so I can assure you these are some seriously glam places for breakfast in Barcelona. Plus, they also serve food throughout the day, including artisanal gluten-free pizzas from Flax and Kale Passage (that can be ordered for home delivery as well). For weekday breakfast (available till 11:45am), expect gluten-free options like deliciously decadent smoothie bowls, avo on homemade toast, and donuts (that were much healthier than I had anticipated). The weekend brunch menu (available till an amazing 5pm!) is a little larger, with some additional treats like gluten-free pancakes – but both menus are really strong no matter which day you visit, so it’s definitely worth venturing to one of their three branches any morning you’re in Barcelona. Gula Sana: if you’re staying in the east of Eixample, around the Fort Pienc area, then this gluten-free cafe apparently does great brunch and cakes. The Juice House: I’ve listed it below as this restaurant is a great all-rounder for healthy eaters, including a tasty brunch menu. We stumbled across this beautifully styled traditional Catalan restaurant whilst trying to find another restaurant in upper Poble-Sec. It’s one of the Grup Filomena restaurants (along with Sarrià and Vil·la Florida in the Sarrià -Sant Gervasi district), which are all housed in beautifully preserved buildings from bygone eras. In fact, having originally opened in 1908, El Sortidor is the seventh oldest restaurant in Barcelona and its vintage style makes it a very atmospheric experience. As the restaurant was filled with locals enjoying good company and good food, it also made the experience one of the most memorable meals we had during this trip to Barcelona. 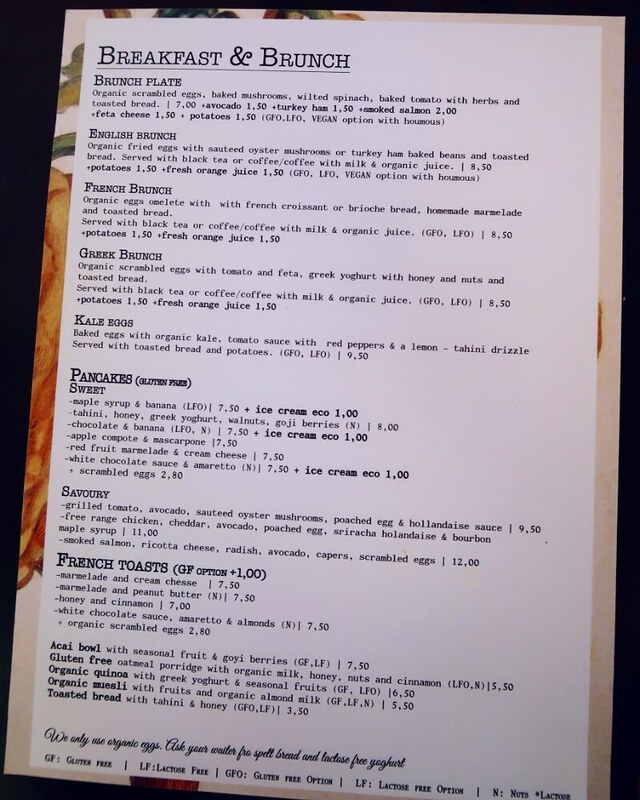 I was surprised to discover that not only was this very traditional restaurant’s menu quite reasonably priced, but it also marked everything ‘without gluten’ clearly on the menu. If you are looking for somewhere amazing to try gluten-free paella in Barcelona, then book yourself a table here. Both the food and wine was excellent, including the Crema Catalana I had for dessert. A perfectly cosy and charming spot for a special dinner when visiting Barcelona. I’d love to return here again. I came across Grupo Andilana a couple of years ago when a friend from Madrid introduced me to these fab but affordable restaurants in their city. They have 30 restaurants spread across Spain, including Balthazar, Les Quinze Nits and La Fonda in Barcelona. Each restaurant has it’s own style and menu, but overall they tend towards classic interiors matched with Mediterranean menus. Plus, they pretty much all serve gluten-free bread, in addition to having a separate allergens menu. I’ve eaten at quite a few of these restaurants over the years but on my most recent trip, I tried their Market Restaurant – as I was staying upstairs at the hotel as well. This one is beautifully styled and was busy every night, so I definitely recommend booking ahead, especially at weekends. I was able to have 3 courses, including dessert for under €25 (plus wine and service), which is quite amazing considering the quality of the restaurant and food. Perfect for a cheap but cheerful romantic meal in Barcelona. I definitely noticed an increase in the number of restaurants serving arepas on my recent trip to Barcelona. If you’ve never encountered this Latin American treat, then La Taguara Areperia is an excellent place to give them a try. Imagine a dish that’s like a large taco in a pita-style pocket bread, made of corn flour (so it’s gluten-free). They’re filled with black beans, cheese, avocado and a range of meat or vegetarian options. The restaurant is very low key – more like a takeaway place – but the walls were covered in amazing Venezuelan plates and pictures, which makes it very vibrant and interesting. Everything on the building exclaimed that the food was gluten-free but as I don’t speak Spanish, it was hard to confirm this with the guy on the counter as his English wasn’t very good. If you’re Coeliac, I would recommend bringing the Spanish restaurant card with you just to confirm that all the options are ok before ordering. The food was really tasty and one arepa was definitely enough for lunch, but I probably could have shared a second one for dinner. I could have easily included this healthy yet tasty restaurant in the brunch section because I had one of the best gluten-free breakfasts in Barcelona when I visited here recently. But I also enjoyed an amazing evening meal with friends here as well on my previous trip, so it really is one of those great all-rounders, no matter what time of the day. It doesn’t look like much from the outside, but head out the back to discover the sunlit dining space, complete with a huge table that’s perfect for groups. In the mornings, you can treat yourself to pancakes and smoothies, whilst in the evenings there are tofu and salmon poke bowls and vegan chocolate cheesecake to be devoured. Bring friends and share some dishes, because this little gem is all healthy yet creative cuisine that is guaranteed to please all foodies. I’ve visited one of Rosa’s restaurants on pretty much every trip to Barcelona over the last decade. They’re a proper Tex-Mex affair, complete with all the elements you would expect: burritos, Corona beers and boldly kitsch interiors (such as the many colourful sombreros). It may not be the most authentic Mexican food you’ll ever try but both restaurants have such a great atmosphere and style that make it a great place to visit. Plus, the food is tasty and they’re both open till after midnight on weekends, so it’s perfect for a late evening feast after drinks. Both restaurants get really busy, especially on weekends and don’t take bookings, so be prepared to queue at the bar with a margarita if you visit during a peak time. 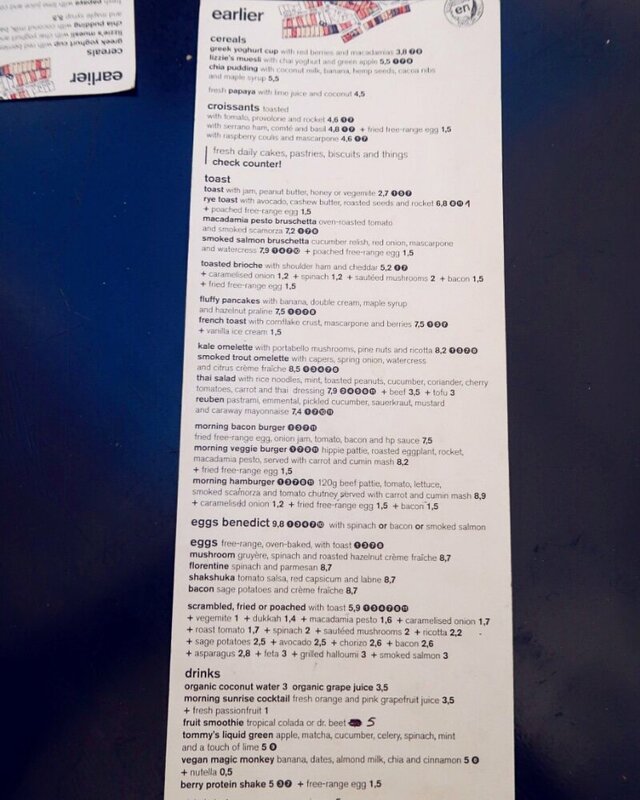 Make sure you flip to the very back on the menu to find the gluten-free options. I opted for the enchiladas, which were tasty and a decent portion too (I feel hungry just looking at the picture of my food again). This is probably one of the best gluten-free Mexican restaurants in Barcelona, especially as our waiter was very informed and able to answer any questions I had in English. Another good gluten-free Mexican restaurant in Barcelona is Pikio Taco. Located opposite the Generator Hostel in lower Gracias, this place has a dive bar vibe and serves up an assortment of soft tacos alongside tequila and mezcal. It’s not a huge restaurant, so I imagine it gets quite busy at peak times. Thankfully, we popped in quite late, just before closing so we able to grab a quick feed. Our waiter was able to point out a couple of gluten-free options on their menu, including the Atlantico with marinated salmon and the veggie Amecameca. Matched with a serving guacamole and tortilla chips, this was a good light meal. This place could be dangerous if you stayed there drinking for a while, ordering small batches of tacos as you go, as the food and drinks are really good and I could have easily stayed and just ate and drank for hours. Perfect for a chilled catch-up with friends. Barcelona is Europe’s skateboarding Mecca, which is pretty evident if you happen to visit this cafe near MACBA. The square outside the art museum is one of the most popular places to skate in the city. So if you fancy watching people pull some tricks, grab a table outside Kino Cafe and marvel at their antics. It’s a great place to chill for a while on a warm afternoon/evening, have some tapas with a few cocktails and soak up the Barcelona vibes. Kino Cafe has a pretty standard kind of menu – tapas, salads and sandwiches – that isn’t that noteworthy except for the fact that it’s relatively gluten-free friendly. There are a handful of items clearly marked GF on the menu, in addition to the burgers, wraps and sandwiches that are all available with gluten-free bread. I opted for the salmon salad, which was really fresh and delicious. Worth stopping by for lunch here when you’re in the area – it’s nothing fancy but it feels like a very authentic Barcelona experience. Messie Pizza: one of the few restaurants serving gluten-free pizza in Barcelona. Gets great reviews and has two outlets in the city – Gracia and Muntaner (Eixample). Gut: a fantastic organic restaurant in Gracia. Excellent food and service, with a clearly marked menu.